On Aliexpress i bought some cheap Dog Bark Chip modules (H-38). ( Price ~ 0,15 euro if you buy 10 pieces). On the sellers page(s) you can also find this illustration about how to connect. I connected a AA battery storage case plastic box holder (2 x AA 1.5V battery) to power this module with 3 Volt. 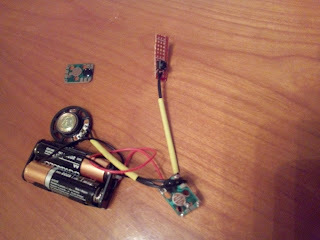 Besides power, a small speaker and a trigger (push button) you need a 360K resistor. (I used 470K as i could not find 360K in my stock and it also worked.) 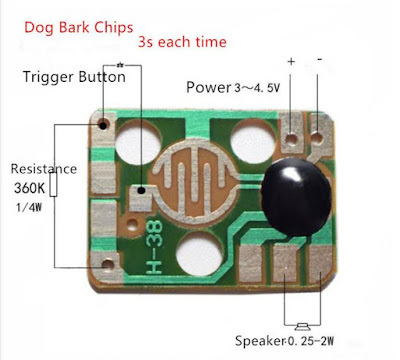 A small speaker can also be found on Aliexpress (~ 0,25 Euro). The complete circuit without battery will cost less than a half euro.